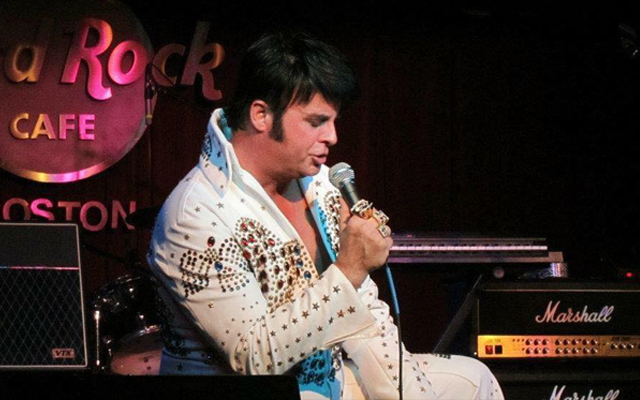 Meet the top booked impersonator on GigMasters in September - Elvis tribute artist, Mike Slater. Mike has been a huge Elvis fan ever since he was a young child. He would sing and emulate The King's voice to escape the reality of the city he grew up in. However, it wasn't until later in life when he actually started singing publicly and performing at private parties. Learn more about Mike's inspiring journey to becoming an Elvis impersonator, why he loves performing, and what advice he has for new GigMasters members. How did you get started as an Elvis impersonator? I became an avid Elvis fan at the age of six when my parents gave me my first Elvis album, "Elvis Rockabilly 1956." I began singing and emulating The King’s voice early in my childhood. Growing up in a city that was inundated with drugs and drug dealers right outside my window, I immersed myself into Elvis’ music as an escape from the reality of where I grew up. It wasn’t until many years later when a co-worker coerced me into singing at a karaoke contest in a bar that my voice would be heard publicly. After winning many karaoke contests, I was asked to perform at a private party for a young lady with cerebral palsy. Prior to the party, I took my first trip to Graceland in Memphis, and I remember pondering on that plane ride how I was going to afford sound equipment, stage outfits, and other essentials necessary for my first job as a professional Elvis tribute artist. While in Memphis, I decided to visit the birthplace of Elvis in Tupelo, Mississippi to further be able to understand the true essence of Elvis. On my way back from Tupelo, I stopped at a casino to try my luck with just the pocketful of change I had on me. At the first slot machine I played, I hit the jackpot, which totaled $2500! I instantly interpreted this as a sign that someone or something wanted me to be able to put on the best show for that sick little girl’s birthday party. I knew exactly how I was going to spend my winnings. Upon returning to Boston with only a short 2 months before my first gig, I immediately had a white Elvis jumpsuit made by a local wedding dress shop and I embellished it myself with rhinestones, jewels, studs, and sequins. I then visited a music store and bought my first sound equipment which included a microphone, mixing board and speakers. To complete my look for the party, I dyed my sideburns as well as my natural blonde hair black and styled it similar to Elvis’s. And so began my 25+ year career as a professional and dedicated Elvis tribute artist. 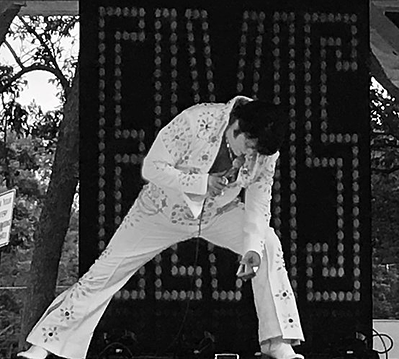 What do you think makes you stand out among other Elvis impersonators? I am just me…Mike Slater. I don’t pretend to be Elvis or think that I am Elvis…I am merely trying to evoke memories for people to relive happy times in their life. I want to carry on the music that got me through my childhood and made me who I am today. That is why I do this. I take my craft very seriously, but have lots of fun doing it. I use top of the line sound and automatic lighting equipment for my show. I am flexible with my rates so I can accommodate most budgets. I keep in touch with fans and make sure they know how grateful I am to have them in my life. What do you enjoy most about performing at events? I enjoy bringing back memories for my audiences and seeing the smiles on peoples’ faces when I perform. As a person who has never had a drop of alcohol or an illegal substance in my body, it’s a high I can’t explain. When I am performing is when I’m the happiest. I truly believe it is what I was meant to do. Do you have a favorite event that you've performed at or one that you're looking forward to? I have done so many different types of events it is hard for me to choose just one. They have included many anniversary parties, birthdays, fundraisers, stage shows, class reunions, and even Facebook weekly online shows. They are all special to me. However, I think the most fulfilling ones are the ones I do at nursing homes and senior centers. It is at these places where just a song, a simple touch of my hand or making eye contact can make a wheelchair-bound person start dancing in their chair, clap or tap their feet. This is the most rewarding aspect of what I do...making someone smile and at least for that moment forget about whatever ails them. I can’t even begin to describe how that makes me feel. What advice or tips would you give new GigMasters members that are just starting out? Stay true to yourself and remember who you are paying tribute to. Allow yourself to make mistakes, learn from them, then move on. Always give back to society when you can, because it will usually come back to you ten fold in the end. Most of all, HAVE FUN because when your audience sees you enjoying yourself and truly loving what your doing, they will feed off that and want to see more of it. Congrats to Mike Slater on a successful month of September (and 3 years with GigMasters)!